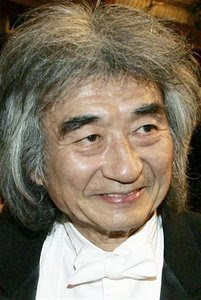 TOKYO (Reuters) - Japan's most famous orchestral conductor, Seiji Ozawa, has been diagnosed with cancer and will cancel all performances for the next six months to concentrate on treatment, his office said on Thursday. One of the first Asian classical musicians to be widely recognized in the West, 74-year-old Ozawa has made efforts to revitalize the music scene in his home country, founding an annual festival in the castle town of Matsumoto. The mop-haired conductor was already due to step down as musical director of the Vienna State Opera later this year, a post he took up after serving almost three decades as director of the Boston Symphony Orchestra.